95% of the discussion in the referendum debates and on the street has been about short term issues that can be resolved one way or the other in the coming days and months (occasionally, months or single-digit years). In making my mind up, I looked at the long term prospects. My feeling is that we’d be better served by a group of much smaller nations working in a loose confederation or treaty structure. Their job should be to handle local issues (yes, this is localism) while compartmentalizing failure modes: the failure modes of a gigantic imperial power are almost always far worse than those of a smaller nation (compare the disintegration of the Soviet Union with that of Czecheslovakia). This entry was posted in Politics and tagged independence, politics, Scotland on 2014-09-17 by Oeystein Hernaes. This can be due to many factors. The surprising finding is that concurrently with going faster, the top finishers have become older. 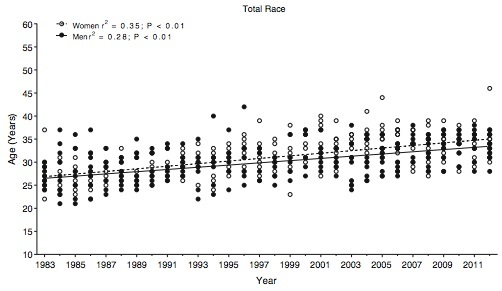 The average age of the top 10 men increased by 7 years, from 27 in 1983 to 34 in 2012! 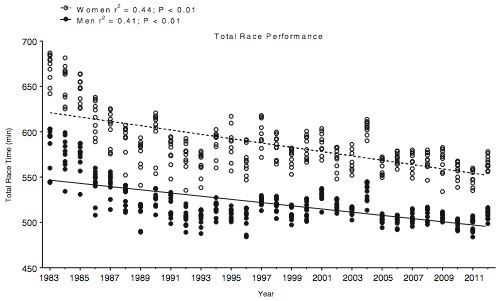 The authors speculate that experience may have become more important with time or that the race may have become more attractive to former professional athletes, but do not know the answer. The point Stewart makes is that the results suggest that it takes time to build endurance and that for most people there is room for improvement regardless of age. This entry was posted in Data, Sports, Uncategorized and tagged age, data, endurance, sports, triathlon on 2014-09-05 by Oeystein Hernaes. A Short History of Nearly Everything (2004) by Bill Bryson. Great book. Popular science history from the Big Bang to the present. Recommended. Odalisque: The Baroque Cycle #3 (The Baroque Cycle: Quicksilver) (2006) by Neal Stephenson. Final part of the 17th century historical novel Quicksilver. We initially get back to Daniel Waterhouse, the scientist from the first part (which is also named “Quicksilver”), now becoming a member of the English court. Eliza has financial and other success in the French court. Much high politics involving England, France, the Netherlands and Germany. The catholic king James II is finally deposed in the Glorious Revolution with the help of William of Orange. Entertaining, and it is always good to learn some science and history. Family Life: A Novel (2014) by Akhil Sharma. Ajay moves with his parents and older brother from India to the land of opportunities US. The accident in which the talented older brother becomes brain damaged changes current and future life of the family. Hardship and lost dreams. OK.
Ratings and old books are in the library. This entry was posted in Books, Reviews and tagged books, reviews on 2014-09-01 by Oeystein Hernaes.